Facebook smed (formentlig for første gang) et dansk medie ud, og strammer reglerne for politisk annoncering – og kampen mod problematisk indhold. Medier har efterhånden opgivet deres VR-planer, og Apple News+ er udfordret på UX. Det og meget mere i denne uges opsamling. Dette er stedet, hvor du kan få overblikket. Det handler om nye medier, sociale platforme og digital udvikling i mediebranchen. Det er dit brief på, hvad der er sket i ugen, så du kommer up-to-date, mens du nyder din morgenkaffe. 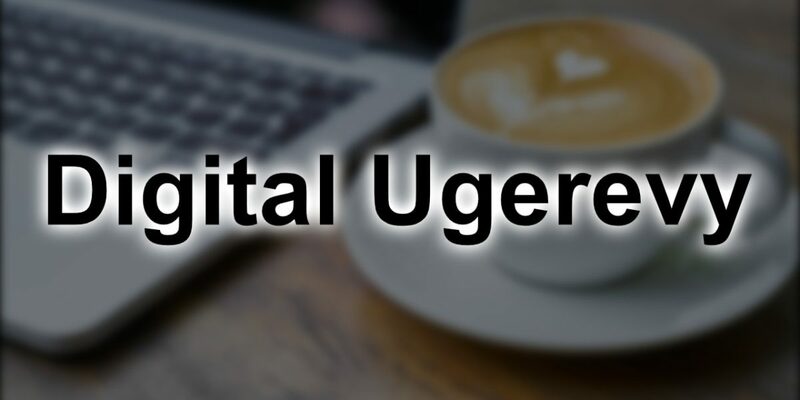 Digital Ugerevy har mere end 500 følgere, der arbejder indenfor journalistik, kommunikation, markedsføring, digital udvikling og ledelse. LinkedIn (også) på vej med "reactions"
– Mig bekendt er det først gang, at Facebook lukker et dansk medies facebookside. Facebook vil screene afsendere af politiske reklamer, før de får lov at promovere deres budskab på platformen. Timingen er under al kritik, mener Venstre. Vi mener, at investeringen i at tage del i samtalerne og sætte personlighed på indholdet bør være en naturlig del af det publicistiske virke — og at investeringen i øvrigt kommer igen i form af loyalitet, kildenetværk og gode historier. Det sociale medie har ifølge EU-Kommissionen ændret betingelserne, som brugerne skriver under på, så det nu fremgår, hvordan brugernes data benyttes til blandt andet målrettet markedsføring. Det sker efter dialog med EU-Kommissionen og forbrugermyndigheder i Europa. Når Danske Medier 7. maj afholder Mediernes Årsdag, håber brancheforeningen, at Facebooks stifter og topchef, Mark Zuckerberg, vil være til stede. Det skriver Danske Medier i en pressemeddelelse. Our analysis of the links 10 cities saw in Facebook’s local news section found funeral home obituaries, years-old stories, and yes, somemeaningful local journalism. But not a lot. Facebook has poured over $1 billion into Watch, its YouTube-like video viewing section, to little success. […] But this is a fight Facebook can’t lose. Facebook wants TV-ad dollars and will continue to tinker away at a video product that can draw users and brand budgets in a significant fashion. What that leaves is a platform that is still in the midst of an identity crisis. Toward that end, Facebook says that improved AI will more consistently prevent memorialized profiles from showing up in “places that might cause distress,” like event recommendations and birthday reminders. And within the new Tributes section, a tab separate from the original timeline will allow people to contribute memorials and posts. As the disturbing messages — many of them racist and anti-Semitic, according to screenshots from reporters — piled up on the congressional livestream, YouTube announced about an hour into the hearing that it had disabled comments on the video feed. For example, Twitter has repeatedly committed to eliminating fake and bot accounts from the platform overall and inactive accounts from users’ follower numbers. Twitter recently changed reporting metricsto “monetizable” daily active users instead of monthly active users. This is becoming more and more common for LinkedIn. The professional networking site, which touted575 million registered members in August 2018, is filled with profiles with multitudes of issues, from profile photos pulled from Google images to an ambiguous job title at a fake company. Med det nye digitale kunstmagasin, Børsen Atelier, vil erhvervsavisen ramme et hul i markedet ifølge topchef Bjarne Corydon. Indholdet skal skrives på “Børsens distinkte måde” – men hovedsageligt af journalister fra mediet Føljeton. Joshua Benton, der er direktør for Nieman Journalism Lab, har (forgæves) forsøgt at finde det premium-indhold fra Vox, som er en del af hans Apple News+-abonnement. Og han har fortalt om den forvirrende brugerrejse. An Irish news publisher has created a new crowdfunding platform for in-depth reports and investigations into stories suggested by the public. Det er altid værd at lære af andres fejl. Sarah Leo er visuel journalist hos The Economist, og hun har samlet en række eksempler, hvor de kunne have gjort det bedre. I grouped our crimes against data visualisation into three categories: charts that are (1) misleading, (2) confusing and (3) failing to make a point. For each, I suggest an improved version that requires a similar amount of space — an important consideration when drawing charts to be published in print. Are you looking for ways to stay ahead in the SEO game? Want to take advantage of the rising voice search trend? The team from DialogTech share their tips for succeeding with voice search in this infographic. Børsen gør magasinet Penge & Privatøkonomi til en del af abonnementspakken på erhvervsavisen uden at hæve prisen. “Økonomisk set synes vi, at det giver mening,” siger Børsens adm. direktør og ansv. chefredaktør. Luminary to launch at the end of the month.The paid audio content app, which has raised $100 million in venture capital pre-launch, announced last week that it will officially roll out to the public on April 23. At the end of 2018, the publisher had 156,000 subscribers, 39,000 are digital-only subscribers. NZZ has over 600,000 registered users. Overall subscriptions grew by 4% last year, and digital-only subscriptions grew by 59%. But the goal is to get to 200,000 subscribers by 2022, with more than 50% of these digital only. By eschewing ad revenue on YouTube for consumer revenue on its own site, All Def Media took a risk, and so far it has paid off. […] Those 25,000 paying customers may pale in comparison to the 4 million subscribers on All Def Media’s main YouTube channel, but the point is they are paying All Def Media and doing so directly. Disneyis investing billions in Disney+, its big push into subscription streaming. It’s set to debut in the U.S. on Nov. 12, at an aggressive initial price point of $6.99 per month. According to Magna Global, OTT accounts for 29% of TV viewing but so far has only captured 3% of TV ad budgets. And as consumers increasingly flock to internet-connected TV devices, a wide range of players — from tech giants, to device sellers to TV networks and more — are building services to capture a share of the ad dollars that will inevitably flow into the OTT ecosystem. Product Management for Newsroom Leaders is a four-week online course to learn how you can think like a product manager and cultivate solutions in your news organization. You will be trained on how to think more strategically and develop holistic solutions to tackle the biggest challenges in your newsroom. On top of that, I’ve been able to confirm with sources familiar with the development of the next major version of macOS – likely 10.15 – that the system will include standalone Music, Podcasts, and TV apps, but it will also include a major redesign of the Books app. We also got an exclusive look at the icons for the new Podcasts and TV apps on macOS. Microsoft is making its Chromium-powered Edge browser available to developers today. The software giant is releasing its Canary and Developer builds, offering daily or weekly updates to the changes that are coming to Edge. Endnu er testversionerne (der som nævnt er målrettet udviklere) kun tilgængelige til engelsksprogede 64-bit Windows 10-installationer, men ældre Windows-versioner og MacOS er angiveligt på vej. Applejust made a significant hire in the virtual reality (VR) space: The iPhone maker has hired serial entrepreneur Arthur van Hoff, a founding executive of the Disney-backed VR startup Jaunt. Van Hoff started at Applein a senior architect position this month, according to his Linkedin profile. China’s top economic planning body has proposed new rules that would see the closure of all local cryptocurrency mining facilities if enacted – a move that would potentially end the country’s dominance in the energy-hungry, yet lucrative industry.